Welcome to the NBA 2K15 portal! 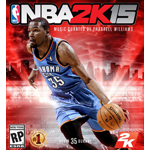 This is a central hub for all the NBA 2K15 content here at the NLSC including news, reviews, feature articles, downloads and more. In this week's Friday Five, Andrew lists five ways that retro teams could be improved and better utilised in future NBA 2K games. In this week's Friday Five, it's part eleven in a series of lists of retro teams that Andrew would like to see added in future NBA 2K games.